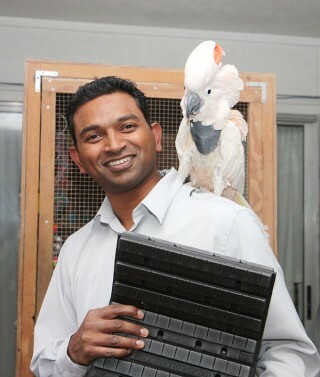 The UT Dallas Naveen Jindal School of Management graduate MBA’03 owns and operates Hagar Collars, which advertises a less mortifying alternative to the Elizabethan-style collar often used by veterinarians. The adjustable foam collar looks like a human neck brace and can be customized to fit animals of various sizes. Paila, a Murphy resident who also works as a consultant, is drawing on his business school teachings to get the word out about his own company. “If I can get the public to know about the product or the option, maybe there’s going to be people who will ask the vet, “Don’t let me walk out with the cone of shame – I heard about Hagar Collars. Can you give me that?’” Paila said. Jackie Kimzey, senior lecturer in Organization, Strategy and International Management and executive director of The Institute for Innovation and Entrepreneurship at UT Dallas, said he was struck by the unique product. Paila continues to stay connected to the Jindal School and has enlisted marketing students to help promote the company. The Hagar Collar was invented after a cockatoo named Hagar (above) removed the veterinary cone it was supposed to be wearing within seconds. The class divided into teams, and each promoted the business in a Google Ad Words competition. Paila gave the winning team a $700 prize, $100 for each student on the team. Edsel said the project taught students about marketing a niche business through social media. The company’s marketing strategy includes the pet that inspired the collar. Hagar, a mischievous cockatoo named after the comic strip character Hagar the Horrible, was plucking its feathers to the point of injury. A veterinarian put on the traditional cone-shaped collar to protect him, said the bird’s owner, Els Bowen. In her desperation to protect Hagar, Brown tried to craft a brace using what she could find around the house. She eventually designed and patented the Hagar Collar. Years later, Bowen turned to Paila, who was her supervisor at a wireless communications company at the time, for help launching the business.